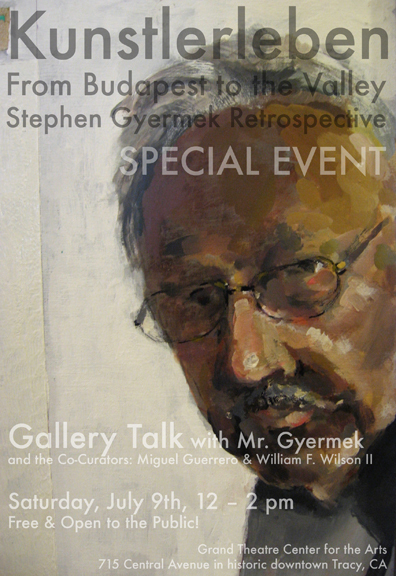 Stephen, Miguel and I extend our sincere appreciation to the nearly 40 patrons who came to the Gallery Talk. Stephen surprised us all, speaking for nearly 45 minutes! He gave the audience an insightful and humorous survey of life events that impacted his development as an artist and art historian. This portion of the discussion was recorded for the project archive. Miguel and I spoke about the exhibition concept and design. In addition it was announced a catalog with a projected release date of mid-September would be produced. Publication and purchase details to follow. A special thank you to all Stephen’s colleagues and past-students who made the effort to be there and share stories and appreciation with the group. Your contributions have made this exhibition all the more special. Kunstlerleben remains on display through July 23rd, 2011. Several works in the exhibit are expected to be purchased. This will be the final two weeks that this exclusive grouping of over 220 artworks, objects and documents from the Mr. Gyermek’s personal collection will be seen together. This entry was posted in Curatorial, Educational Resource and tagged Stephen (Istvan) Gyermek. Bookmark the permalink.